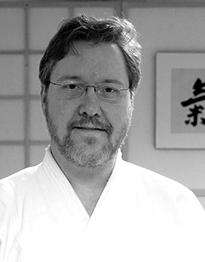 Matt began training Ki-Aikido in 1999 at the Virginia Ki Society under George Simcox Sensei. He has traveled to Japan several times for intensive training retreats at the headquarters dojo in Tochigi prefecture. He has also accompanied Shaner Sensei (EKF Chief Instructor) to Japan and Russia as his otomo (attendant and assistant) several times. In the 2004 International Taigi Competion in Japan, he and his Taigi partner, Jon Poppele Sensei from Minnesota, were awarded two gold medals and one bronze medal. Matt is an Assistant Ki Lecturer and began teaching adult and children's classes in 2004. He has also led outreach programs to local high schools and juvenile detention centers. He currently works as the Director of Engineering for a growing technology start up outside Washington, DC. Matt is currently Sandan in Ki Aikido and Chuden in Ki Development. He is an Assistant Authorized Examiner.